Akim, after so many years of isolation, is learning from Muna about the joys of affection and what it means to be a social chimpanzee. Seven-year-old Akim was rescued and brought to In Defense of Animals - Africa’s Sanaga-Yong Chimpanzee Rescue last December after enduring years in a tiny cage measuring only 3 x 3 feet. The truck driver who was keeping her caged had traveled frequently, and sometimes left her for days without food. Somehow, she survived the inhumane confinement, isolation and starvation. When she arrived at Sanaga-Yong, she was extremely malnourished, engaged in self-injurious behavior (such as throwing herself so roughly against the cage walls that she frequently wounded herself), and didn’t know how to interact gently with anyone. Adult female Muna lived in Mintak’s social group of 14 for many years, but Mintak, who is unfortunately a very poor leader, began bullying her last year. He alternated between his gentle behavior, during which times Muna seemed to really like him, with barrages of torment that included biting and beating. He pulled much of her hair out with his teeth. We considered rescuing Muna from the group, but she had many friends there and at times seemed happy. We weren’t sure what she would want, and we hoped the situation with Mintak would improve. However, in early February, Muna herself decided she had had enough and left their enclosure. She took a strong shock from the electric enclosure to get out. When she indicated later in the day that she wanted to go back into the enclosure, we opened the door for her. But a few days later, she left the enclosure a second time. This time she didn’t want to go back, and we didn’t force her. Later in February, Akim and Muna were introduced to each other in a new integration cage/enclosure complex, where they still live. Muna is kind and gentle with Akim, who adores her. 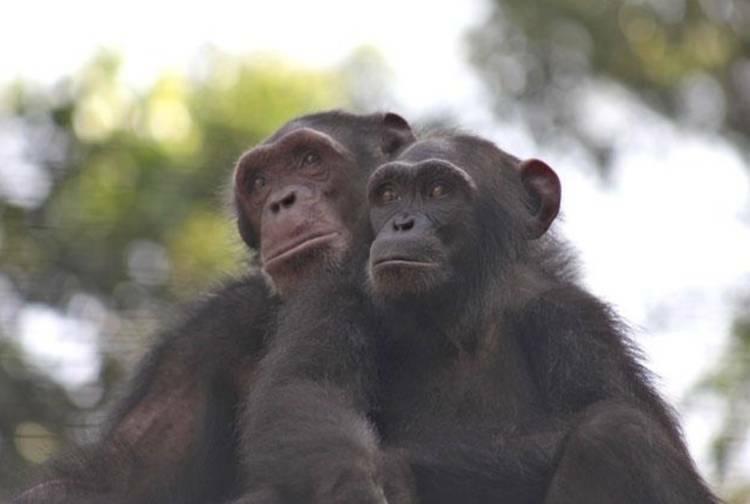 Within a few months, the two will be introduced to a larger group of chimpanzees, but for now Akim, after so many years of isolation, is learning from Muna about the joys of affection and what it means to be a social chimpanzee.